Sectys of Y.M.C.A., bldg no. 4, Camp Lewis Oct. 2, 1918. UR. Bailey; UC. Ferris; UL. Forland; Lower Right Luard Lyman Woodward; LC. Lewtas; LL. Munsey. Photographed by E.L. Meyer, Tacoma, Wn. under permit granted by Sec'y of War, April 20, 1918. 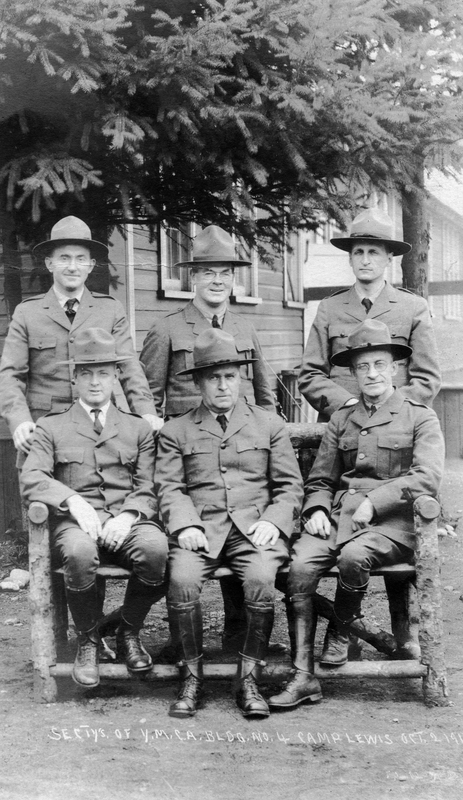 Description Group portrait of 6 secretaries of YMCA. Transcription Sectys of Y.M.C.A., bldg no. 4, Camp Lewis Oct. 2, 1918. UR. Bailey; UC. Ferris; UL. Forland; Lower Right Luard Lyman Woodward; LC. Lewtas; LL. Munsey. Photographed by E.L. Meyer, Tacoma, Wn. under permit granted by Sec'y of War, April 20, 1918.